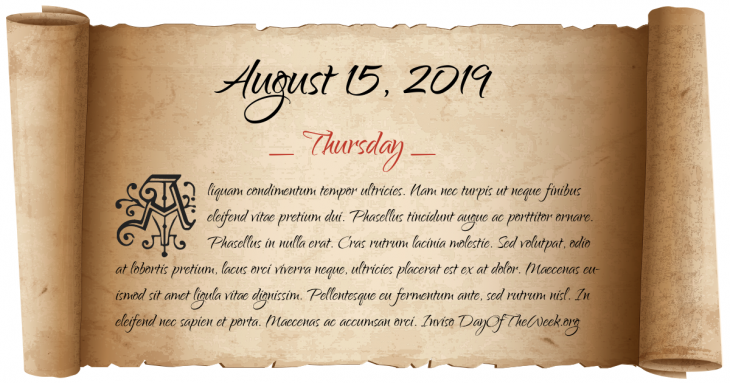 What Day Of The Week Is August 15? Panama City, Panama, is founded. Saint Ignatius of Loyola and six classmates take initial vows, leading to the creation of the Society of Jesus in September 1540. Tivoli Gardens, one of the oldest still intact amusement parks in the world, opens in Copenhagen, Denmark. Ordination in Constantinople of Fr. Raphael Morgan, first African-American Orthodox priest, “Priest-Apostolic” to America and the West Indies. James Joseph Dresnok defects to the Democratic People’s Republic of Korea after running across the Korean DMZ. Dresnok still resides in the capital, Pyongyang. Bahrain gains independence from the United Kingdom. Who were born on August 15?